Last fall, I made a change to eat better. Instead of going out to lunch 5 days a week, I cut back to once a week and then cook healthy meals at home. It's not a diet but a lifestyle change. I loosely follow Dr. Weil's plan. I need to lose weight but I don't want to go on a diet. Diets where you cut out a lot of calories just aren't a good idea. I also know I need to exercise but can't afford to join a gym. The change was gradual. I first started eating more at home. Then I started avoiding things like fried foods. I do eat those not-so-good foods sometimes but I try to make better decisions. A couple of good things had occurred. I have noticed than my knees no longer feel stiff nor do they crack when I squat. Also, the headaches are pretty much gone. So anyway, I am losing weight but very slowly. Since I started in October, I have lost over 30 pounds. (It's not that much when you realize where I started. And, no, I won't say where I began.) It's pretty good but I am getting a little frustrated. I know weighing myself everyday doesn't help but I can't help it. As least I don't do it twice a day or more like Bridget Jones. Last week I saw an Apple iPhone ad where they showed using the app, Lose It! I checked it out and got a copy, because it was free. I have counted calories in the past and I know it works. It's the accountability thing. Noting that you ate 3 brownies for dinner makes it real. And seeing the nutritional facts for foods will help you choose the best option. I make homemade granola and a serving is only 1/2 cup. Normally I eat a whole cup (or more) and that adds up to 510 calories and 24 grams of fat! Sure it's pretty healthy but you don't have to eat so much at one time. One of my biggest temptations is going through the kitchen. It's so easy to grab a cookie (or two) when I get Andy a drink or change the laundry. I did check the calories on one EL Fudge cookie and found that ONE cookie has 90 calories! 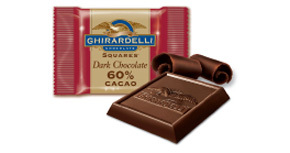 One piece of Ghirardelli 60% Cacao Dark Chocolate Square has 26 calories and has antioxidants. See, that choice was easy. Of course I have to limit myself to 3-4 pieces a day so I need to find some better finger food like grapes or carrots. Years ago, I used a program called BalanceLog that was made more Palm OS. It was a great application that included special diets for heart conditions or diabetes. Unfortunately, that company was sold and the the app is no longer supported for Palm. Too bad they didn't stick around because I think they would have made lots fromt the iPhone. There are other options. FitDay is great for keeping track food and exercise for you. There is a Windows version but there is also a free online version. I used this for a while last fall when I was trying to set a baseline of what I should be eating. One of the annoying problems with all of these programs is finding your foods. They all have pretty good databases but there is always something missing. It takes some time in the beginning but then it's pretty easy to use. Lose It! is pretty easy to use from the beginning. And if you have an iPhone or iPod Touch, you will comfortable using the interface. I started using it on Wednesday. I decided to just eat and see where I ended up at the end of the day. Oh man! This is not good. The raisins in my oatmeal add up to 126 calories for a 1/4 cup serving. I guess I will give those up even though they are healthy. Potato Chips are 150 calories per ounce. My portion was more like 2 servings or more. One ounce is about a handful. OK, I can do if I quickly put away the rest before I grab another handful. And the shocker, 2 new potatoes amount to 259 calories! Ugh. So now I am making even better choices. The convenience of having this app with you at all times is great. I was wondering if I should get cole slaw from Chick Fil A. The 210 calories didn't scare me so much as the 17 g of fat! Fat, in cole slaw? I skipped it. And I learned the I can get by with just the Chargrill Chicken Deluxe Sandwich at 280 calories with 7 g of fat. Then I can get home and have some fruit if I am still hungry. I am not sure how long I will stick with this. I get bored so easily but the beginning has been good. Since Wednesday, I have lost almost 5 pounds. Really? And this is pms week?